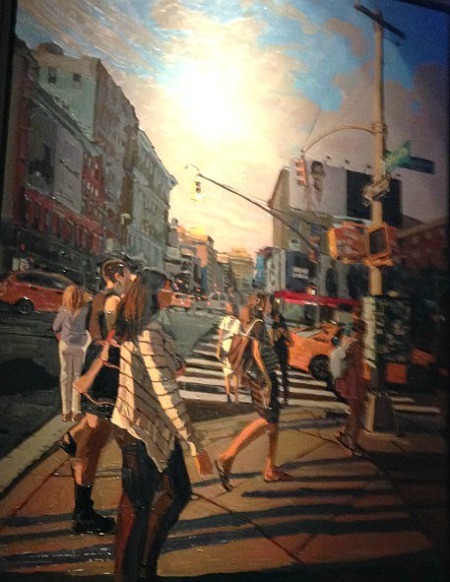 If you find yourself on West 44th Street, take a stroll through the lobby of the Sofitel New York. It’s a chicly retro space where you can plop on a sofa without brandishing a room key and chat with a friend or check your messages without being strong-armed into ordering a drink. As a bonus, through October 21 the lobby once again doubles as an art gallery, displaying new paintings by Sonya Sklaroff, an urban landscape artist whose richly colored oils celebrate such iconic, if unexpected, emblems of city life as water towers, neighborhood streets and the muted hues and dueling umbrellas that accompany an impromptu summer shower. Art shows are nothing new at Sofitel, which has displayed everything from black-and-white photos of 20th-century artists culled from the pages of Paris Match by Olivier Widmaier Picasso (yes, Grandpa Pablo was included) to soft-edge photos of beauties like Cindy Crawford and Uma Thurman by French photographer Giles Bensimon. As for Sklaroff, this is her third show at Sofitel, so she clearly understands the concept of a hotel doubling as a gallery. “I like showing my work here,” she said at the opening night party, noting that unlike a gallery, where works appear on white walls in empty rooms, a hotel lobby replicates a home. “Collectors can see how a painting looks above the fireplace or over the sofa,” she said. 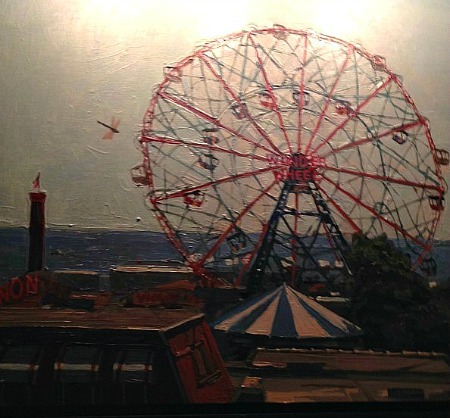 Or better yet, above a computer, like “Wonder Wheel from the Q,” a small, engaging rendering of Coney Island’s soaring landmark hanging in the business alcove adjoining the lobby. Whether it is their New York subject matter or the warmth generated by a classic medium like oil paint, the 24 paintings on display seem more like permanent residents than guests checking in for a week or two. Perhaps that was why you saw more than a few visitors actually looking at the art, a rare sighting at an art opening with wine and excellent nibbles. For pictures with instantly recognizable content, Sklaroff’s paintings flaunt slyly abstract moments, like the flash of red that makes you rethink a bicycle tire (or its connection to the red bookstore nearby) or the contrasts between light and dark in almost every work (she’s partial to painting skies). Seeing eye-catching shapes in everyday sights, she finds poetry in water towers instead of skyscrapers, fire escapes rather than bridges, and offers a fresh, vibrant look at familiar surroundings. Sonya Sklaroff, Sofitel New York, 45 West 44th Street, 212 354-8844. Extended through October 28. The show was was curated by G & O Art and the paintings can be seen at www.goartonline.com. Looks like a very apt art show for the “chicly retro space” of this Sofitel. 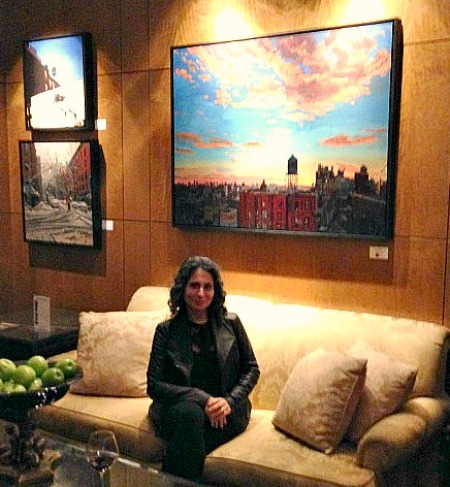 We were so thrilled during our most recent stay at the Sofitel last week to see that Sonya Sklaroff’s works were once again on display. I spent a long time lingering over them…As a former resident of NYC, these beautiful images evoke wonderful memories for me. I’m not often moved by artwork, but Ms. Sklaroff’s incredible works have accomplished this many times over! The more art in public places, the happier I am! Good job, Sofitel. I could feel the mushiness of the snow under my feet. I could hear the horns honking from the taxi’s. I could feel the summer breeze on my face from the evening sky. I only wish I had more wall space in my NYC apartment to hang one of Sonya’s paintings cause they looked fabulous on the walls of the hotel lobby. At least I have a coffee table for her book . . .